Click the button below if you'd like to email me about house concert bookings. A house concert is a house party with your neighbors, friends or community. Enjoy a hassle-free acoustic music performance in the comfort of your home. House Concerts bring artists into the heart of the community where they can experience the music up close. It can take place in the cozy setting of your home, yard, barn or any setting with neighbors and friends. Socializing with a finger-food potluck and asking people to bring their favorite beverage can be a fun and low-cost way to mingle before the show. I should point out, a house concert doesn't have to take place during the weekend. In-fact, having it on a weekday is a great way to break up the work week and playing time, etc, can be adjusted accordingly. DETAILS DETAILS.... HERE'S EVERYTHING YOU NEED TO KNOW. So, you think you might be interested in hosting a house concert?? It's good, then, that your first question is: Um, what the hell exactly is a house concert, anyway? It's a perfectly reasonable question -- and I'll try and answer it, clear as I can -- so you can make a more informed decision for yourself whether or not you'd like to host such a thing. 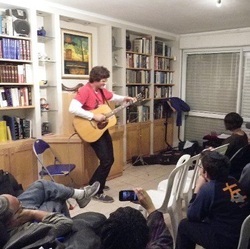 A house concert is a concert hosted in a house or an apartment or a community room, as opposed to being hosted by a regular public venue (like a bar or coffeehouse). Beyond that broad distinction, there are no hard fast rules for what makes for a house concert and what doesn't. But here's what's typical . . . Depending on the available space (and the comfort level of the host), house concerts range quite a bit in size and scope. Some are as small as a 10 people in a little living room. Others are 50 people in the basement. Others are 100 people in a backyard. Everyone settles down in the living room on chairs and on couches, and on throw pillows, and however they can find a comfortable nook for themselves -- and then the music begins. The music is usually completely acoustic with just a tiny little help from my small amp to bring up the volume for the softer finger-style instrumentals. Depending on the space, once you start getting bigger than about 35-40 people, you need to start thinking about having a small PA system to help supplement the natural acoustics. But usually they're smaller, and they're unplugged. I usually play two 40-minute sets with a short rest room and food break in the middle. But shorter or longer sets are easily accommodated, as well. And I'm happy to play whatever songs you'd like to hear most (provided I still remember how to play them). Enthusiastic word of mouth is by far the most affective way to get folks to come to a house concert you are hosting. Share some CDs around among your friends -- urge folks to visit the website and check out some tunes. I've got lots of promotional materials I can make available to help you put together an enticing invitation to send or email to your friends and family and coworkers. If you're excited about the house concert -- then spread that excitement among your friends. They'll be intrigued, at least. It's my job to win them over -- it's just your job to make them curious enough to give the music a try. I like to keep everything sliding scale, myself. I know that everyone's in a different situation financially. Typically the host will collect a suggested donation from the guests -- either at the door, or during the break, or however. The suggested amount ranges from between $5 to $15 per person -- with $10 being pretty typical. I tend to leave it up to the host how much is an appropriate amount to ask of their guests. And I never begrudge any guests who are unable, or choose not to, contribute. Here's a couple of good collections of resources for you if you're interested in hosting a house concert(s!) . . .